The outdoor classroom structure is the anchor of our project. It will create a place for outdoor learning. It will encourage us to get out into nature and explore issues in context. It will provide the tools needed for teaching, learning, and building community and identity. 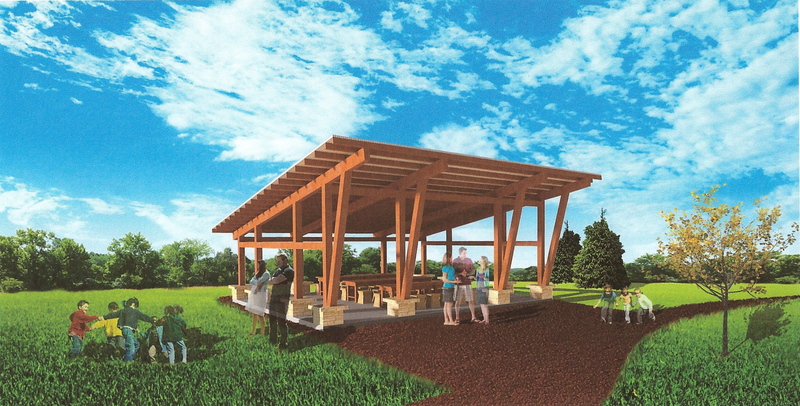 The plans for this structure are the result of multiple design charrettes lead by the fourth graders of the 2010-2011 school year. They have been further developed by our architect and MATC instructor (Lincoln parent) Jessica Klehr. This structure will be the most costly aspect of our Outdoor Learning Laboratory. Findorff Construction has signed on to be our construction partner. Provide comfortable and exciting space for outdoor teaching and learning in context. Provide shade for users of the expansive outdoor space, especially our community and school gardeners, and our intergenerational partners from the Burr Oaks Neighborhood Association. Art in, on, and around the structure will provide a sense of pride, ownership, and serve as a tool for the preservation of community history. These art projects will be used to forge a greater connection between the school and knowledge and expertise of the surrounding community. 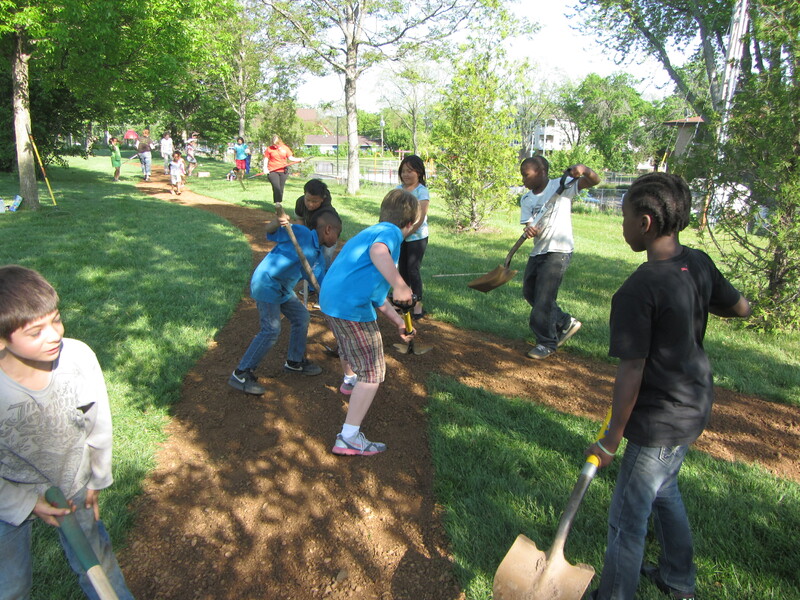 This path of crushed granite stretches for a quarter mile around the outdoor space.It was completed with support of our landscape architect (and Lincoln parent) Bob Downing.The path took four work days and over sixty-five volunteer workers, including staff, students, families, and community members, and a lot of muscle. Access to a safe space for walkers and runners in the neighborhood, kids on the playground, and our Girls on the Run club. Provide easier access for gardeners walking to the school and community gardens. Create a space for intergenerational learning that focuses on physical and mental well-being. Lincoln has three different garden areas. One area features native Wisconsin plants. Flowers and grasses and shrubs grow in this small garden. 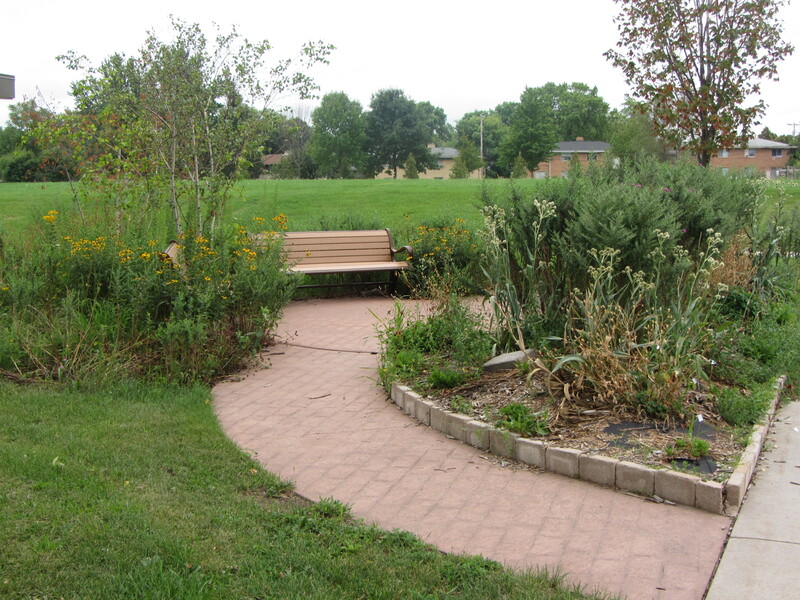 Two benches invite one to relax while watching the butterflies and bees visit the flowers. Another is a raised bed "compass rose" garden designed to show the four directions. 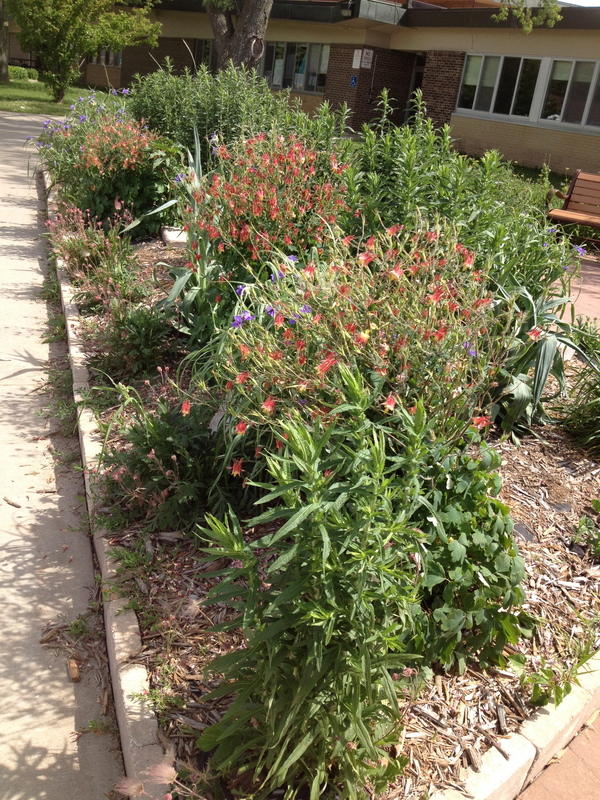 These beds feature perennial flowers, bulbs, and herbs. 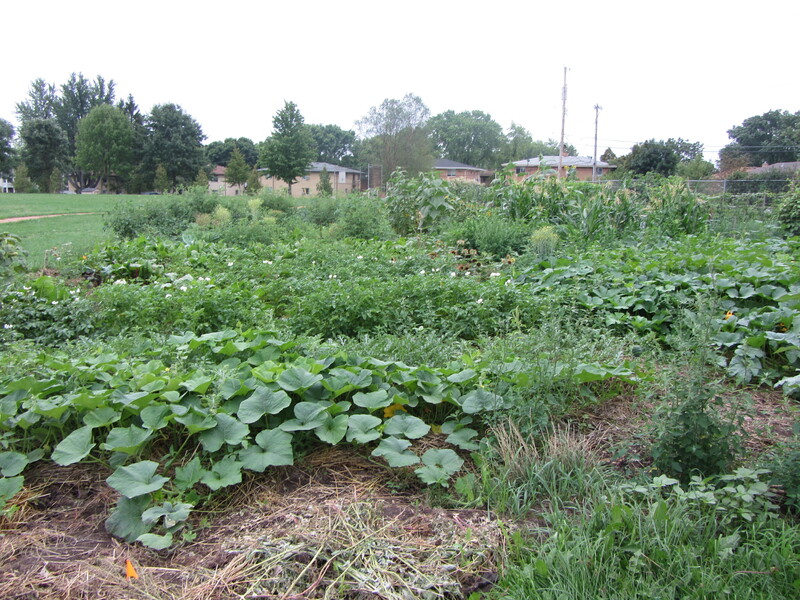 Our main vegetable garden is a 3200 square foot area adjacent to a community garden. 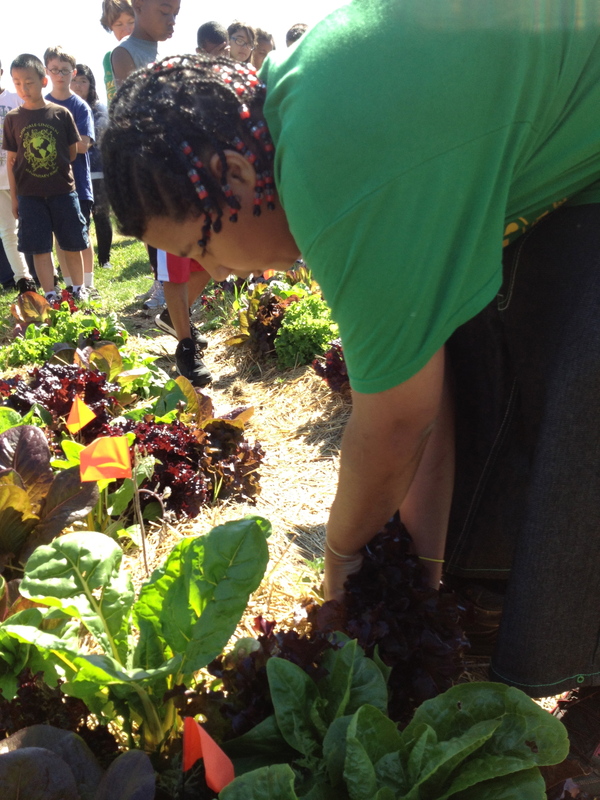 All students in the school work on various aspects of the garden including starting plants indoors, transplanting them outside, mulching, tending to them, and harvesting them. 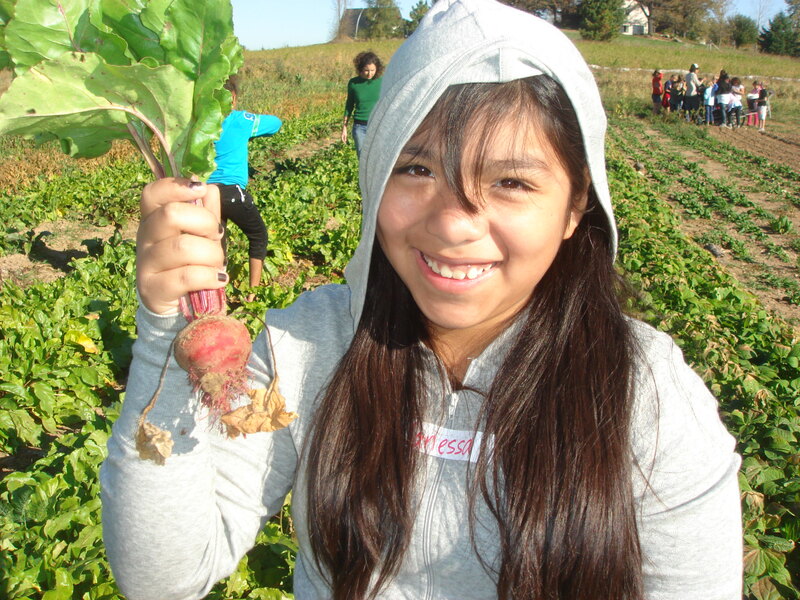 We grow a large spring salad garden; large enough to feed the school and to donate to our local food pantry. 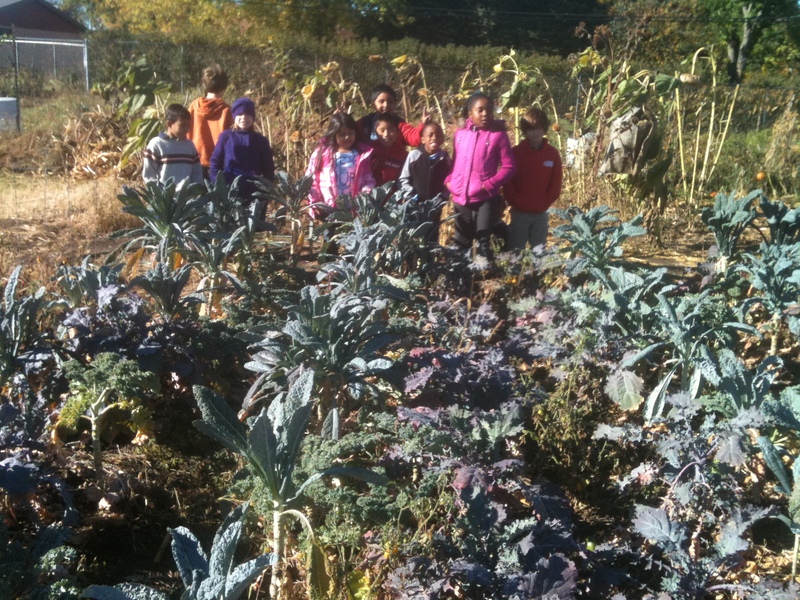 We also grow crops to harvest in the fall, such as kale, collard greens, potatoes, squash, pumpkins, and popcorn. 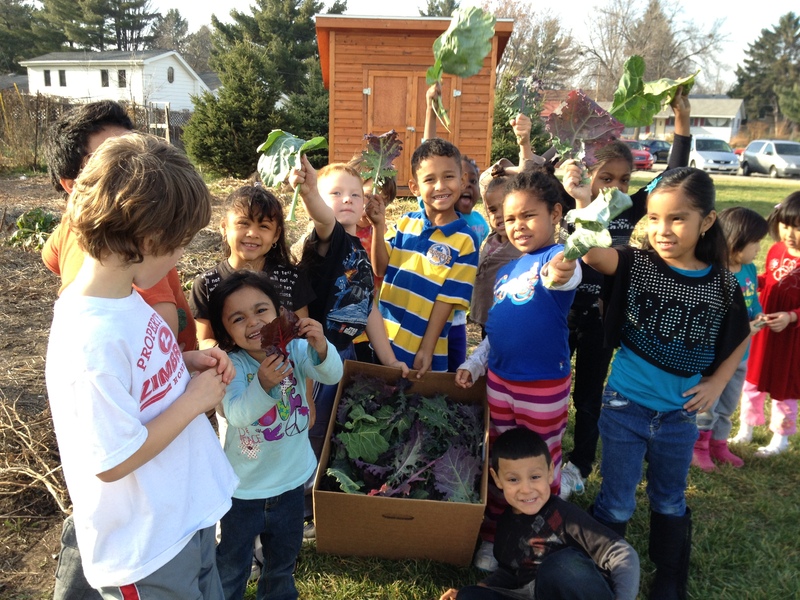 Blue Moon Community Farm, a local CSA Organic farm, help us start plants and teaches classes as our "Farmer in the Classroom"
This shed houses all of the tools needed for gardening with K-5 students. It will also house a variety of resources to facilitate teaching and learning outdoors. Williamson Grocery Cooperative Community Reinvestment Fund- generously provided funds for our garden shed. 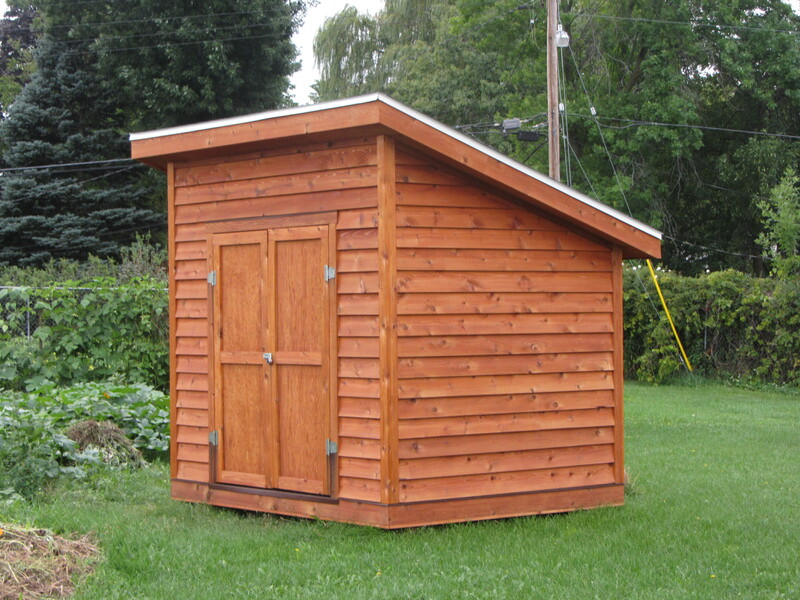 Wisconsin Medical Society Foundation helped fund our garden shed and tools. Offers students an opportunity to explore an ancient, global, sustainable, environmentally friendly, and community strengthening form of construction. Each student studied architectural forms and shapes. They then drew a design for the cob wall, made a clay model, and voted on the design they thought would be best. 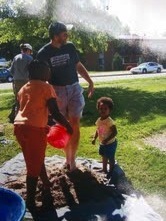 Students and community members dug out and built the foundation for the wall. 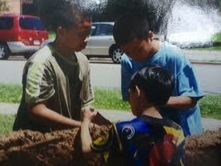 In the spring, we had a cob stomp in which every student had the chance to mix the sand, clay, straw, and water to form the cob. Finally, students and community members worked with a natural building expert to form the wall and the protective roof. Students recently designed and added a new dimension to the wall by creating a glass mosaic scenes on the surface. The entire project has focused on student centered design, building a strong sense of community by constructing something together, and the idea of taking raw or broken materials to create something beautiful. The space created by the wall has since become a place for gathering, imagining, conversation and, recently for exploring the complex detail of the mosaic designs. 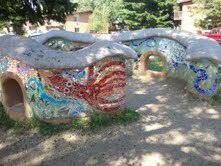 The Cobb Wall is used not only by the students of our school, but also for the community in general. By creating more well designed and beautiful spaces like this on our campus we instill a sense of community pride, natural engagement, and opportunities for exploration. Thanks to the dedicated efforts of our art teachers Gwen Kong and Meri Lau, and our grant writers Rachel Martin and Nancy Gutknecht. The Artist for the project was Beth Campbell. 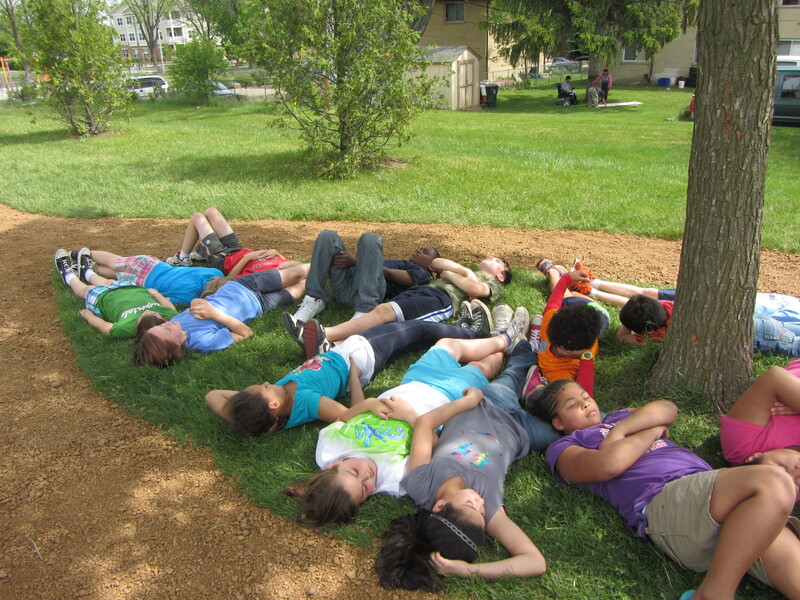 In 2012, Lincoln was awarded a Special Initiatives grant from the NASA Wisconsin Space Grant Consortium to design and install a Human Sundial on our grounds. Through a special collaboration between the Art, Music, and REACH programs, students will be spending some time learning about the Earth and Sun relationship, the seasons, shadows, and time. They will study ways people have expressed their interest in these themes through art and music throughout the ages and in many cultures. 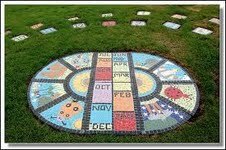 Each student will produce a mosaic-tile paver that will be part of the final installation of the sundial. Standing in the appropriate space on the sundial, a person will be able to tell the time of day by seeing where their own shadow falls. The sundial will be located near the Outdoor Classroom and, we hope, will prove to be an intriguing, beautiful, and educational resource for many years to come! Above is an image inspiration for what we think our sundail will possibly look like. 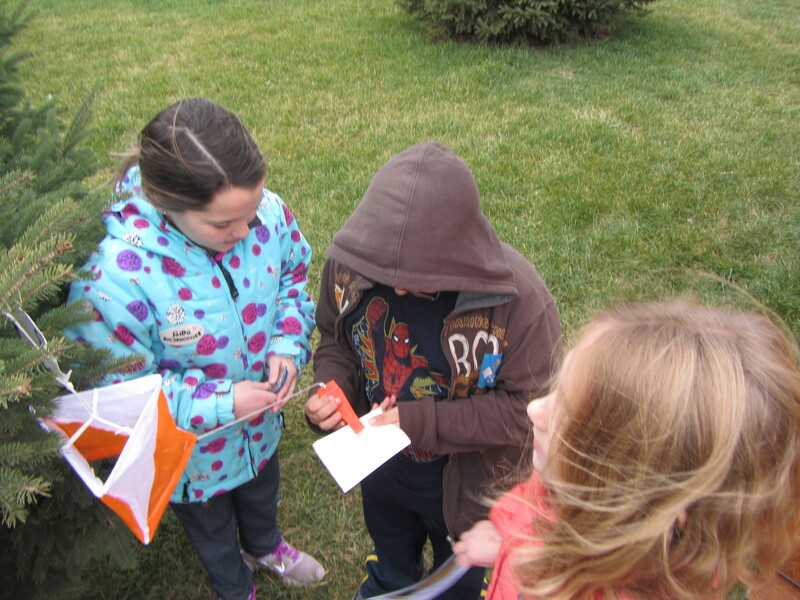 In an orienteering event, participants use a map and compass to navigate to a series of markers placed throughout an area. A highly detailed map is the primary tool used in orienteering. This map displays all of the significant features an orienteerer would see along the way from one point to the next. 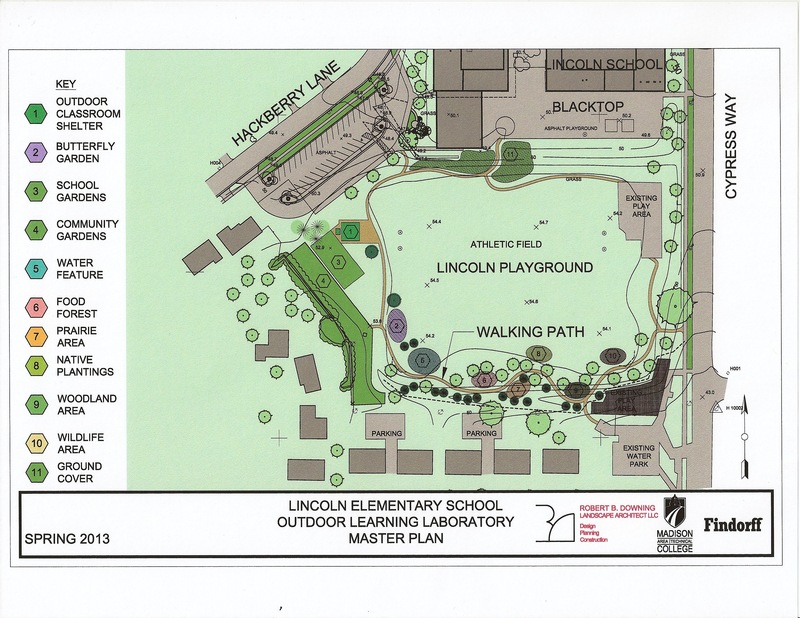 The Lincoln School orienteering map and course were created by Lincoln parent and orienteering enthusiast, Susie Madden. Orienteering is a recreational and sometimes competitive sport that takes place in parks, cities and forests all over the world. There are approximately 80 orienteering clubs in the United States, and hundreds more worldwide. Clubs typically create the maps and organize events. Lincoln 4/5 Teacher and birding enthusiast, Laurie Solchenberger, has been collecting data with her students during the 2011-2012 and 2012-2013 school years. Our focus is learning about backyard birds' habits and habitats. 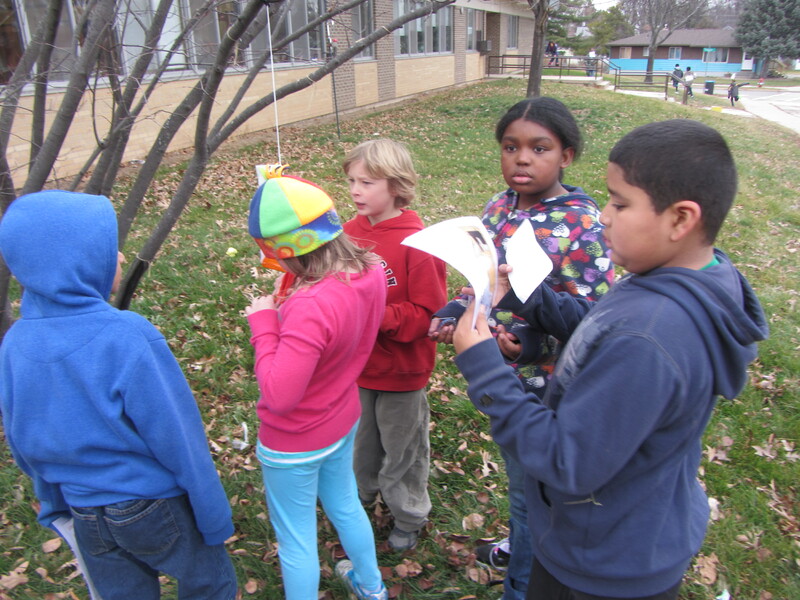 Students track bird species' presence in the outdoor space throughout the seasons. 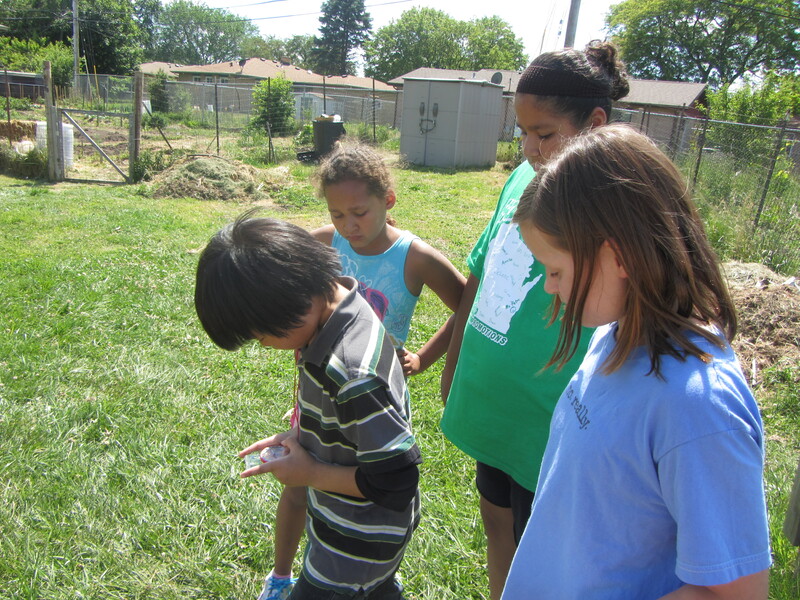 To prepare for "field work" in our outdoor space, students make daily observations at our own birdfeeders. They also use Cornell University's allaboutbirds.org website to identify backyard birds by field markings, song/call, behavior, and habitat. Binoculars bring birds and squirrels up close for detailed observation! Daily written field notes include date, time, weather, species seen, and habits. Website pictures and videos help us visually compare/contrast backyard bird species. Vocalization links help us identify backyard birds by songs and calls. We are learning to "bird by ear"! Maps help us identify seasonal presence and migration patterns of backyard birds. 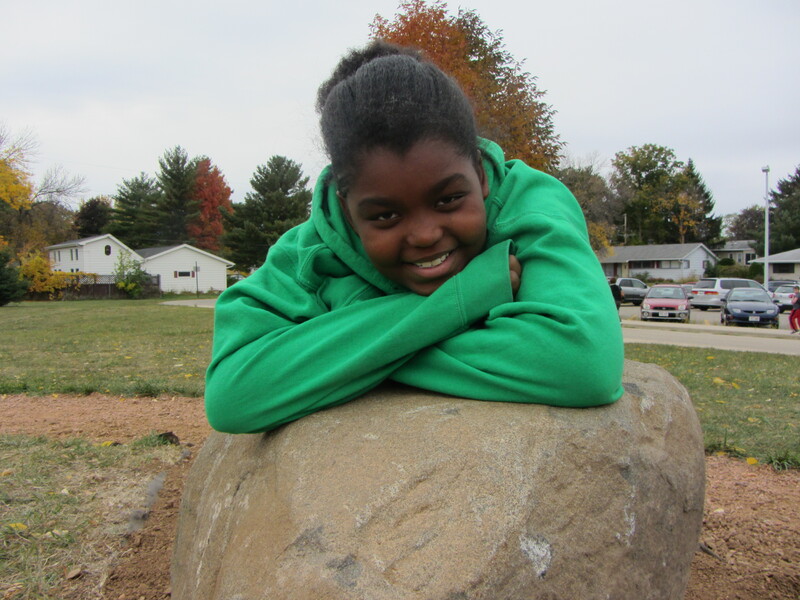 Each year, every student "adopts" one backyard bird species about which they become an "expert". We use the outdoor space for our field work, taking clipboards, binoculars, and bird books into the field to gather information about our birds. 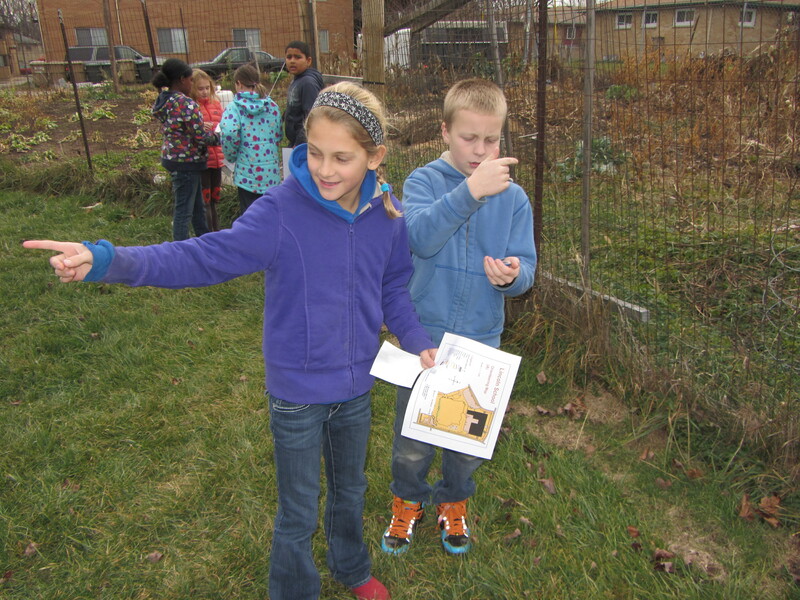 Students learn their bird's vocalizations, field markings, habits, and habitats. 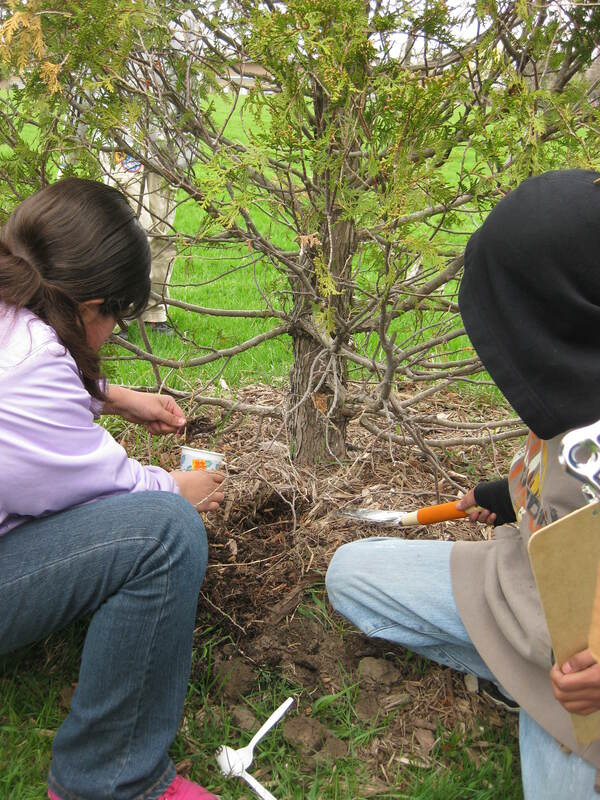 Students spend enormous amounts of independent worktime researching not only their bird, but the type of environment their bird needs to survive. Students then teach each other through use of field outings, drawings, writing, and presentations. We complete bird censuses, collecting data about bird numbers and species for use during our math lessons. We create visual maps to begin to truly "see" what surrounds us. We create "sound maps" to become familiar with all the "little things" of which we may not be aware. We pay attention to the types of calls and songs birds make, knowing each means something different to the maker of the sound. Students love hearing the bird "stories" happening in their neighborhood! We make focused sketches and drawings to become fully aware of details in what we are really looking at. Last year, students each drew a cyclical calendar illustrating their bird's life cycle, which we turned into a book for our classroom library. 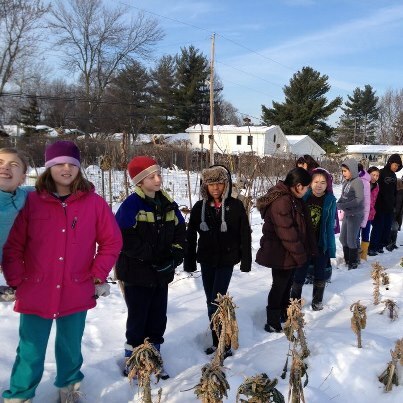 This year, our classroom is participating in Cornell University's Project Feederwatch. In the future, it would be wonderful for our outdoor space to include bird- and butterfly- gardens, birdbaths, Bluebird houses, bat houses, and a classroom set of binoculars so students do not need to share in pairs. It would be exciting for community guest speakers to visit our outdoor space and demonstrate techniques such as mist-netting, bird-banding, and setting up field research sites. A school-wide, and perhaps neighborhood-wide, celebration of International Migratory Bird Day would be something to work toward!